Update on October 14th, 2018: Hallo folks, I’ve decided to take down Tech Comm on a Map—this means I’ll remove the web page and unpublish the Android app. The web page will remain available until the end of November, to give people time to fix up any pages that are using it. The Android app will remain installed on your device if you’ve previously installed it, but it won’t be available for new installations. My blog post has more information. Update on December 1st, 2018: I’ve just removed the map from the web app, replacing it with a message saying that Tech Comm on a Map is no longer available. Technical communicators love to know what’s happening in their area of expertise around the world. What better way to show it, than on a map? Tech Comm on a Map (available on the web and as an Android app) puts technical communication titbits onto an interactive map, together with the data and functionality provided by Google Maps. You can use this online form to add an item to the map. Tech Comm on a Map (Android) is also available as an Android app. Societies, including societies and associations. Groups for smaller groups and regular meet-ups of technical communicators, either as part of a larger society/association, or as an independent group. Businesses for commercial organisations specialising in tech comm, such as consultancies, recruiters, publishers, independent technical writers, and so on. Courses for educational programs and technical communication courses. The map shows only courses that are long-term or repeated. It’s not practical to show short, once-off workshops, webinars, or seminars. Other, a grab bag to catch anything that doesn’t fit into the above categories. To see the information for an event or any of the item types, click or tap one of the coloured circles on the map. You can also zoom into a particular city or address, by entering the place name or address in the search box. There’s also an option to choose the type of information shown on the map. For example, if you only want to see the 2016 conferences, de-select all the other types. Would you like to embed the map onto your own web page? Do you have some items to add to the map? Use the Tech Comm on a Map Android app, or this online form, to add an item to the map. The item can be a conference, society, group, business, educational course, or other titbit that technical writers will find interesting. Any items you add will be saved for moderation, and will appear on the map once they’ve passed review. Type: Conference, Society, Group, Business, Course, or Other. Name of the business, group, society, course, conference, or other thing. Street address (this is essential, to position the item on the map). Start and end date (optional). Note: Don’t add the names or addresses of any individuals, unless it’s your own name and address. We need to ensure we have people’s permission before adding their information in a comment on this page or on the map. Any information you add here should be already publicly available on an organisation’s website or other publication. A few people have access to update the spreadsheet . (See the section below about contributors.) Any data added to the spreadsheet appears on the map immediately. How does Tech Comm on a Map work? More on the Android app coming soon! Thanks to the following people who contributed data to the map at the start of the project, helping me to get it started: Sarah O’Keefe, Ellis Pratt, Stefan Eike, Richard Hamilton, Nils Bier, Tom Johnson, Vadim Popov. Thanks also to Stefan Eike and Stephen Farrar, who have both contributed to the code on GitHub. The code on GitHub: Tech Comm on a Map. The web page on GitHub: Tech Comm on a Map. Featured on the Google Geo Developers’ Blog: Putting your Professional Group on the Map. The introductory blog post on 7 May 2014: Introducing tech comm on a map. The map is ready for 2017 events, August 2016. New feature, August 2016: Share a tech comm location on the web. New feature, October 2016: Share a tech comm location from the Android app. 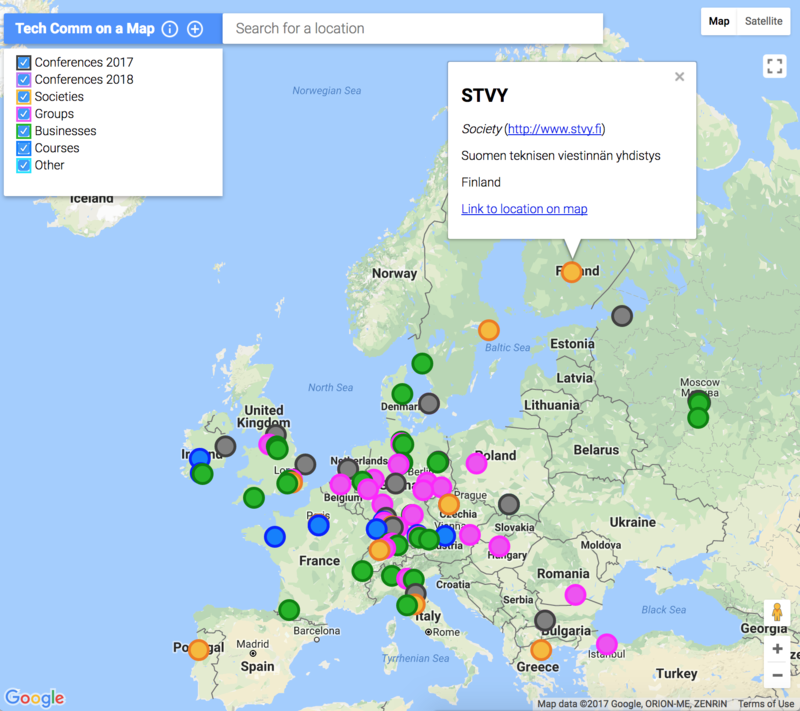 2018 conferences now open on the map, December 2017. Although I work at Google, this app is not a Google product. •	The Macedonia-Thrace Chapter of the Greek Computer Society is a scientific, non-profit society that was established back in 1985 in Thessaloniki with the dual aim to promote the use of Information and Communication Technologies (ICT) in the regions of Macedonia and Thrace as well as to represent the ICT professionals of the region. The Macedonia-Thrace Chapter is an official annex of the Greek Computer Society which is based in Athens. Nice! I’ve added the society to the map. does not works on Firefox. On Chrome and Internet Explorer Works fine. My Firefox version is 30.0. Thanks for reporting this. Hmm… I’m using Firefox 30.0 and it works for me, on Windows and on my Mac. There must be some difference between the environments we’re using. Great, thanks for the info! I’ve added the group to the map. Great work, could it be possible if you share a copy of the Spreadsheet, trying to do a same example, but not loading the info. Thanks! Hi, I run a technical writing business in the UK and would appreciate being added to the map. Description: Experienced contract/freelance technical writer in the Midlands, UK. Street address: 161 Coventry Road, Hinckley, Leicestershire, LE10 0JS, UK. i’ve taken your idea and modified it slightly to post the location and other personal data of classmates from the naval academy prep school. is there a relatively simple method in the maps api to automatically convert the data in the address/city/state/zip fields into lat/long and push that back into the spreadsheet? FYI, I’ve recently published an API picker that helps you find the API that matches a particular need. The page gives a good feeling of the various APIs available. Hi Sarah, kindly add us on the map. Description: This group is intended to help technical writers in Switzerland to make connections, build a professional network, find work opportunities, and discuss technical communication. Thanks Antti, done. You’re on the map. To help you debug this problem, people will need to look at your code. Suggestion: Post a question and the relevant code on Stack Overflow. There’s a helpful and knowledgable community of people there. This looks like an interesting conference. There’s not yet enough information to put it on the map, since neither the date nor the location is finalised. Looking forward to seeing more about it soon. This one looks a little far removed from technical communication, so I haven’t added it to the map. Dr. Joyce Locke Carter from Texas Tech is the 2015 Program Chair for this conference. Dr. Cater is a techcomm professor and scholar, so it might be interesting. Thanks Yvonne! It’s now on the map. Wow, this is an intriguing conference. It’s one I’d love to attend. I can’t put it on the map yet, as I don’t have a category for 2016. Coming next year. Thanks so much for this one, and all the above. I’ll visit this page again in a couple of months, to see if there’s any more information about dates/locations for the events that are not yet on the map. Description: The TCeurope 2015 Colloquium will offer sessions on information delivery, emerging technologies, and methods for engaging users. Practical sessions will provide technical communicators with the tools and information needed to succeed during periods of change. Thanks for the info! It’s great to learn about so many tech comm conferences. TCeurope 2015 Colloquium is now on the map. Could you please add this Russian conference to the map? Thanks! Description: Конференция Яндекса для специалистов в области разработки и локализации технической документации. Thanks for the information! The conference itself (http://tconference.ru/) seems to be primarily about translation rather than technical communication. Translation is very important to technical communication, of course, but I’d like to keep the map focused on tech comm conferences, at least at the moment. Please do let me know if I’ve misunderstood the purpose of the linked pages. Description: Spectrum 2015, STC Rochester’s 56th annual conference. Our field has changed considerably over the years and continues to change on an almost daily basis. Titles like technical writer, editor, or illustrator persist, and new titles emerge, like information architect, usability expert, and content manager or strategist. Software tools are constantly changing and evolving, and employers often require familiarity with a variety of tools. But to a greater or lesser degree, these positions still tap core communication skills. This year’s theme is “Communicators by Any Other Name: Beyond Titles and Tools.” Our keynote speaker is Kit Brown-Hoekstra, STC Fellow, current Society president, and an experienced and respected consultant, trainer, speaker, and content strategist. Thank you – it’s on the map. Thanks so much also for all the data that we used to add the STC chapters to the map! Hi Sarah, it’s a shame that none of the links in the popup descriptions on the map are clickable — at least not in Firefox on my Mac. Is there anything you can do about that? You’re right, they’re not clickable. I couldn’t figure out how to do that when I wrote the code. They are copy-pastable though. Description: A technical communication community that aims at building a resilient and innovative culture. It takes advantage of the tech comm market which is only just emerging and does not have the baggage of practices and traditions. Instead of implementing change, be the change. It is centered around an annual conference. Thanks! After some debate, I’ve added soap! as a conference, since that’s the focus of the site. It’s on the map! Description: A gathering of individuals and companies using, or planning on using, Darwin Information Typing Architecture (DITA). Presentations, panels, and discussions are presented by peers and industry experts. Street address: Monthly Meetings held in various corporate locations in Austin, TX. Thanks Wayne, you’re on the map. • Description: Learn from managers, information architects, technical experts, authors, trainers, and others who have worked hard to develop outstanding solutions for creating and delivering content effectively. Learn from the successes and pitfalls they’ve encountered. Engage in conversations with those who share your concerns, can address your questions, and bring their experience to bear on your plans and hopes. Nice one. It’s on the map! hi Sarah – great endeavor. Please consider adding MEGAComm 2015 to your map. This is an annual conference that takes place in Jerusalem, Israel in February/March. This coming event will be February 26, 2015 at Cinema City in Jerusalem. It is a gathering of techcomm professionals and marcom professionals for an intensive full day conference. The website is http://www.megacomm.org. I think I added my details to this project a while ago, but seeing the article today I notice that I’m not on there any more! I’m an independent technical writer based in Paignton, Devon. My website is http://www.winnerhillwriting.com. If you want to put me on the map that would be great, thanks…it’s a neat idea, and Paignton should be on the map for something! •East Carolina University’s Department of English offers a fully online 33-credit master’s degree with a concentration in technical and professional communication. The program offers extensive coursework in all areas of technical writing and professional communication, including technical editing and documentation; writing in the sciences, healthcare, and public policy; communication and digital media; international professional communication; visual communication and information design; and teaching and training in technical communication. Our program is well suited to students planning to enter communication fields as well as professionals in other disciplines who wish to strengthen their communication skills and expertise. •East Carolina University’s Department of English offers a fully online 15-credit graduate certificate in professional communication. Certificate students select five courses from the same range of courses available to our MA degree students; students can specialize or take courses from across the breadth of our technical writing and professional communication, including technical editing and documentation; writing in the sciences, healthcare, and public policy; communication and digital media; international professional communication; visual communication and information design; and teaching and training in technical communication. The certificate program is well suited to professionals for whom communication is an important secondary skill set and those making lateral moves from other professions into the communication field. •East Carolina University’s Department of English offers a 15-credit (five course) certificate program in business and technical communication. The certificate provides students with opportunities to develop analytical and practical skills in planning, writing, designing, editing, and managing a range of professional texts for print and online publication. The certificate is open to students enrolled in any undergraduate degree program, and provides a great complement to many other degrees and career paths. I’ve added the website for the university. If you have a more specific website address, I’d be delighted to use that one instead. Great job Sarah! I would like to add my technical writing business in Italy and I would appreciate being added to the map. Description: Technical Communication, Content Strategy, Training and Recruitment for software and CE marking manufacturing companies. Thanks! I’ve added Writec to the map. Great project! We would appreciate being added to the map. Thank You for starting this really useful map! Please, could You add our software house, specialized in developing solutions for the technical communication? Description: KEA develops software solutions for the Technical Communication: Argo Technical CMS; database publishing solutions for Adobe InDesign and FrameMaker; help online, web catalogue and e-commerce solutions; technical documentation to be published on Apps, Augmented Reality and Internet of Things applications. Please, could You add our Company, specialized in developing solutions for the technical communication ? Thanks for adding winnerhillwriting.com to the map… and a Happy New Year to you, Sarah. Happy New Year to you too, Julian! Sarah, This is an awesome map that you’ve created. Thank you for taking the time to do this for our tech comm community! Hi Sarah, We have a DATE CHANGE. Can you please update the CMS/DITA North America 2015 Conference, in Chicago, Illinois? It will be held on April 20-22, 2015. Thanks so much! YOU are the VERY BEST! Thanks Sarah! Hi Sarah, this is a great project. I wonder if you could add the following course to the map? Name of the course: MA in Technical Communication and E-Learning. Description: This master’s degree program in technical communication and e-learning has run at the University of Limerick since 2010. It is available in both online and face-to-face delivery modes. Street address: University of Limerick, Limerick, Ireland. Thanks! I’ve added the course to the map. Many thanks indeed for adding our course to the map Sarah! Description: This 120-hour (two semester) post graduate, non-credit certificate program provides students with the skills and tools to clearly and accurately inform users about technical information. Description: With two concentrations to choose from, this graduate degree in technical communication can help advance your career in technical communication as a technical writer, tool expert, content strategist, or technical trainer. Also available 100% online. Thanks for all that info! The conference and courses are now on the map. Thanks! You’re on the map. ACM SIGDOC focuses on the design of communication as it is taught, practiced, researched, and conceptualized in the fields of user-centered design, technical communication, software engineering, information architecture, and usability. Thanks Fer, I’ve added the conference. Description: The Symposium will offer a rich scientific program of highest quality with invited speakers from all over the world and intends to bring together scientists, engineers, ethicists and practitioners from different disciplines to discuss questions and concerns related to ethics in science, technology, and engineering. Issues will be explored both from a scientific point of view and from a social or individual aspect, including global, multicultural perspectives. I’ve decided not to add this conference to the tech comm map, as it doesn’t focus on technical communication. Ok, hopefully I’ll be presenting at it and I can try to get them to focus more on ethics in technical communication as it applies to how techcomm mediates technology to users–and maybe it can be added in subsequent years. Thank you for creating this huge project – a unified Techcomm map. Could you please add the key information about our company based in Russia? Description: Сompany specializing in preparing technical documentation in IT sphere, technical translation, business analysis, technical documentation expertise and training. We cooperate with major system integrators, state and public institutions, bank and health sector. The art of technical communication is our mission. Thanks for the info! Docco is now on the map. could you please add our society to your map? Name: Gesellschaft für Technische Kommunikation – tekom Deutschland e.V. The Gesellschaft für Technische Kommunikation – tekom Deutschland e.V. is the German Association for Technical Communication. tekom Deutschland represents and connects around 8,000 professionals who are active in technical communication and related fields. The main task of the association is to represent the interests of creators and users of user information and training. it would be great if you could add the following conferences taking place in 5 cities in Europe (Roadshow) as well. tekom Europe organizes a special one-day conference on technical communication that will be held in five different locations in Europe. The roadshow is targeted at decision-makers and professionals for technical communication who are eager to learn about the latest industry trends and who want to share their experiences and knowledge during our interactive sessions. The Information Energy 2015 will focus on the main topic “Content as a service – turn data into information and information into knowledge…” The conference program covers topics such as user experience, enterprise content and big data, structured content intelligence, and e-learning. “Information Energy” is a two-day event. The first day is a conference day with international speakers and visitors. The second day is Tools Day where solution providers are invited to present, and attendees are invited to participate, in forums and interactive sessions. Description: The Evolution of Technical Communication (ETC) is the annual gathering event for all technical communicators in Bulgaria. Started by an inspired team of the local community, ETC is now running under the organization of tekom Bulgaria. The goal of this event is to educate, to share news and ideas, to foster networking and exchange of ideas as well as to assist the local community in developing high professionalism in the area of technical communication. Thanks for all the information, Kiriaki! I’ve added these conferences and societies to the map. STAR is a supplier of services and software – worldwide, media independent and in all languages. STAR is offering solutions and services for Intelligent Content Management, Technical Translation, Technical Documentation, Electronic Publishing, Information Management and Translation Workflows. 30 years of experience and STAR’s innovative technologies guarantee maximum efficiency, quality and flexibility. The European TRADOS User Group (ETUG) is a forum for users of SDL translation tools, allowing them to meet other users, exchange their experiences with the SDL tools and get to know other users’ translation workflows and solutions. We also intend to use this forum to gather development requests that the users would like to see addressed by SDL. The forum works together with SDL to improve the SDL products in such a way that users benefit the most. RWS Group Deutschland is a supplier of translation, localization and terminology services in the fields of technical documentation, marketing, financial and legal affairs. RWS Group is the specialist for the use of translation-assisted technologies and for developing and implementing customised processes and solutions. Thanks for the two additions. They’re both on the map now. When will this be available for ipads? Hallo Lisa, That’s a good question. I need to build up my Swift and iOS skills. At the moment, there’s no timeframe – I haven’t kicked off a project to develop an iOS version of the app. But I agree it’d be a good thing! Some old STC chapter information is on the map and I do not see a means to correct or remove a pin from the map. Did I miss that? Otherwise this is a great project I am happy to support! The map itself doesn’t offer a way to update existing information, other than editing the spreadsheet directly. Adding an update feature would be an excellent addition to the code! To request an update/deletion, you can either put a comment here letting me know what needs fixing, or you can “add” an event using the online form, but put comments in the description telling me what to change/remove. Just a quick tip if anyone finds nothing loading on the map; some ad blockers or other privacy tools might prevent the items from loading. I’m using Chrome and nothing loaded until I disabled Privacy Badger for the site. Thanks for letting me know. I’ve changed the address. Here’s the new location on the map. Would you be able to contact the two Iowa STC chapters? I believe they are no longer active. I’ve contacted both a few times throughout the past two years and I either can not get a response or they state they don’t have any current meetings. If they are no longer active, can you please remove them? Thank you! Thanks for pinging me about the two Iowa STC chapters. Going by the events page of the Eastern Iowa chapter, that group is quite active. The Central Iowa chapter doesn’t have any recent blog posts or other activity that I can see. I’ve sent them a message via the contact form on the site.